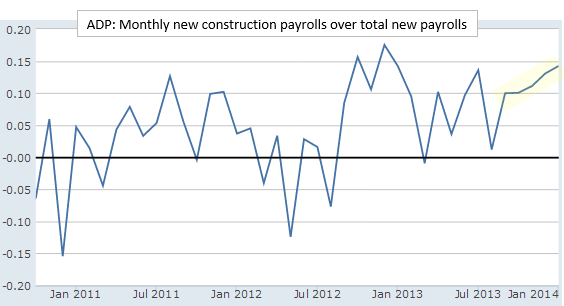 There wasn't anything particularly special about today's ADP private payrolls number. The company estimates that about 175,000 private sector jobs were added in January. The slowdown in manufacturing (see post) resulted in some job losses in that sector - which remains volatile. The one area that continues to show resilience however is construction. Over the past 5 months the proportion of jobs from construction has remained unusually stable - from 10 to 15% of total new monthly private payrolls. As discussed earlier, construction spending is at such low historical levels relative to the overall economy, that it would take only a small increase to create a significant jump in new construction payrolls. The chart below shows the number of US construction jobs (in thousands) per one billion of GDP (in 2009 dollars). Clearly nobody expects this to get to the pre-recession levels any time soon, but there is still a great deal of room for growth. And unlike many new service jobs that suppress wage growth in the US (see post), construction employment could actually improve the situation.